"Fine Street Art experimento como nunca antes"
AN EXPLOSION OF COLOR. “Rocco’s American Life” – An art collection thought lost and forgotten is to be revealed for the first time in 28 years. As vibrant as the day they were painted, created in San Diego during the early 90s, stored away, nearly abandoned, even thought tossed away, until now: America’s largest collection of Satoshi Akiyama a.k.a “Rocco” The Father of Japanese Street Art, a collection of bold fine street art unseen for a generation, will be on display at the 7000 sf. Design Consignment Gallery [DCG] overflowing with interactive color and good energy. DCG is excited to be hosting Rocco as Artist in Residence featuring Rocco’s art studio, live painting exhibitions, music, dance and workshops. 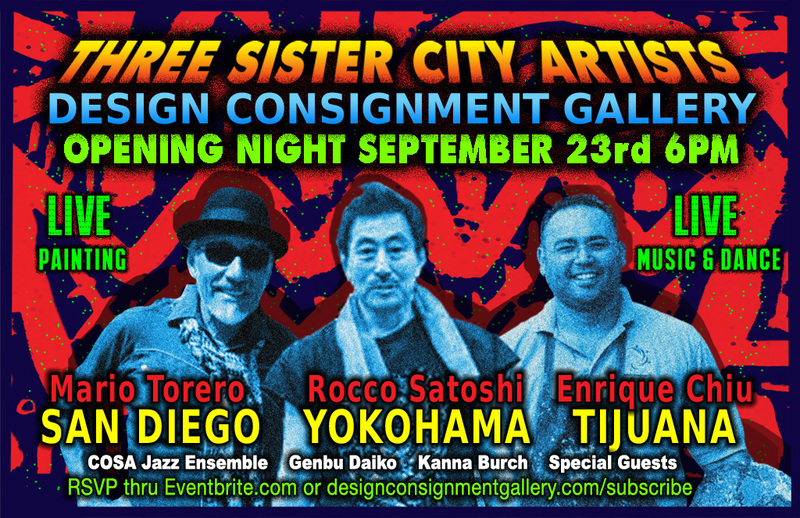 Also featuring San Diego artist Maria Elena Cruz and others all curated to complete the vision of celebrating this passionate art with live painting exhibitions, music and dance with an entire gallery of paintings that come alive with 3D glasses.